How do I launch a VPN gateway? How can I avoid managing multiple VPN user certs? How do I scale out VPN solution? How do I setup Okta authentication for VPN? How do I enable Geo VPN? How do I add a VPN user? What user devices are VPN client software supported? Is NAT capability supported on the gateway? Is full tunnel mode supported on the gateway? Can the maximum number of simultaneous connections to VPN gateway be configured? What is user profile based security policy? How do I setup profile based security policies? How do I assign a user to a profile? What if I want to change profile policies? How do I change a user’s profile programmatically? Is DUO multi-factor authentication supported? Can I combine LDAP and DUO authentication? How does Policy Based Routing (PBR) work? What are the monitoring capabilities? Does Aviatrix OpenVPN® solution support SAML client? When should I use the Aviatrix VPN client? 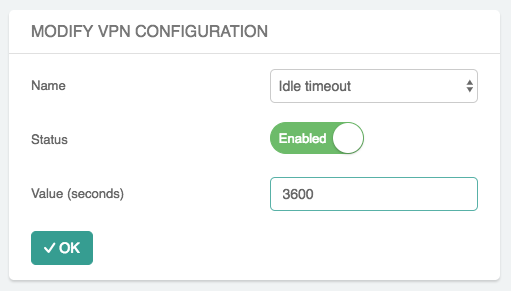 Are multiple VPN configuration profiles supported by the Aviatrix VPN client? What is “Client Certificate Sharing”? How to fix Aviatrix VPN times out too quickly? Where do I find the log for the Aviatrix Client? Why can’t my VPN client access a newly created VPC? How to turn off NAT with OpenVPN® gateway? What IP Address is used for NAT’ing the VPN Clients? The controller launches an Aviatrix gateway instance in AWS/Azure/GCloud. The gateway instance must be launched from a public subnet. You need to give it a name (The name is presented as a Gateway Name field), this name becomes part of the instance name with a prefix CloudOps. In the Create page, select VPN Access to enable OpenVPN® server capability. There is a default VPN CIDR “192.168.43.0/24”. But you can change it, make sure the CIDR is outside the existing and future VPC CIDR range. This VPN CIDR is where VPN server assign virtual IP address to each user when she connects. You can select Save Template to save the gateway template. When you come to the page the next time, most of the fields are pre populated. You may change any of the fields. If you have multiple VPCs, launching a VPN gateway in each VPC and create VPN users is not the correct way to manage. It forces your developers to carry multiple .ovpn certs and learn when to use which one when connecting to a VPC. Leverage VPC to VPC connectivity to build a scalable solution. You can launch multiple VPN gateways in the same VPC. By default the first VPN gateway in a VPC is launched with a NLB. Subsequent VPN gateways in the same VPC are automatically associated with the same NLB, enabling a scale out VPN solution, where the NBL load balances incoming VPN user sessions. It is required to have consistent gateway configuration when NLB is enabled. For example, authentication methods, tunnel modes and PBR configurations should be identical. If you have global workforce that needs to access the cloud, Geo VPN offers a superior solution. Geo VPN enables a VPN user to connect to a nearest VPC that hosts Aviatrix VPN gateway. To enable Geo VPN, go to OpenVPN® -> GEO VPN. Also check out this link for help. After at least one gateway is created, you can add VPN users. Click OpenVPN® -> VPN Users -> +Add New. If you prefer to not share the .ovpn file with your users via email, do not enter the email address when you add a VPN user. You can then download the .ovpn file from OpenVPN -> VPN Users -> Select VPN User and then download the file and share it with your VPN user via your prefererrd file share mechanism. If you like to assign user profile based policies, you need to create profiles first, see the next section. Windows, MAC, Linux, Chromebook, Android and iOS devices are supported. Yes, you can enable NAT function at gateway launch time. When enabled, instances on the private subnet can access Internet directly. If full tunnel mode is selected, you may want to enable NAT to allow instances in the VPC to have direct Internet access. Yes, both split tunnel and full tunnel modes are supported. You can specify the mode at the gateway launch time. Full tunnel means all user traffic is carried through the VPN tunnel to the gateway, including Internet bound traffic. Split tunnel means only traffic destined to the VPC and any additional network range is carried through the VPN tunnel to the gateway. Any Internet bound traffic does not go through the tunnel. To enable full tunnel mode, go to Edit Config -> MODIFY SPLIT TUNNEL, select No, as shown below. Yes, you can set the maximum number of connections at the gateway launch time. In VPN access, a user is dynamically assigned a virtual IP address when connected to a gateway. It is highly desirable to define resource access policies based on the users. For example, you may want to have a policy for all employees, a different policy for partners and a still different policy for contractors. You may even give different policies to different departments and business groups. The profile based security policy lets you define security rules to a target address, protocol and ports. The default rule for a profile can be configured as deny all or allow all during profile creation. This capability allows flexible firewall rules based on the users, instead of a source IP address. The security policy is dynamically pushed to the landing VPN gateway when a VPN user connects.. It is only active when a VPN user is connected. When a VPN user disconnects, the security policy is deleted from the VPN gateway. When a user connects to a VPC, the security policies associated with the profile that the user is assigned to are applied to the VPN gateway instance that user logs in. This effectively blocks traffic from entering the network. Click OpenVPN® -> Profiles -> +New Profile to create profiles, then click Edit Policies to add rules. You can add multiple of them, click Save. Click Update for the rules to take effect. When you create a VPN user at OpenVPN® -> VPN Users -> +Add New, you can select profile option to assign the user to a specific profile. You can also attach the user to a profile at a later time. Go to OpenVPN® -> Profiles. Click Attach User on a specific Profile and select a user that is added to the VPN gateway. You can change profile policies any time. However, the users who are currently active in session will not receive the new policy. The user need to disconnect and reconnect to VPN for the new policy to take effect. The controller provides a REST API which can be invoked to change a user’s profile. Refer to API document under Help menu. During this operation, the user’s existing VPN session will be terminated. The new profile policy will take effect when he or she logs in again. The use case for this feature is to allow administrator to quarantine a VPN user for security reasons. Yes. If your enterprise has a DUO account with multi-factor authentication, it can be integrated into the VPN solution. From Gateways tab, click Create. At two-step authentication drop down menu, select DUO, then enter your company Integration Key, Secret Key and API hostname. To obtain Integration Key, Secret key and API hostname, login to DUO website as an admin, www.duo.com, click on the left panel Applications, click Protect an Application below. Scroll down the application list and select OpenVPN® (click Protect this Application), the next screen should reveal the credentials you need to configure on the Aviatrix controller. For additional help, follow this instruction. Currently advanced feature such as Trusted Device and Trusted Networks are not supported. Send us a request if you like to integrate these features. Yes. With both LDAP and DUO authentication methods enabled on a gateway, when launching the VPN client, a remote user will have to enter his or her LDAP user credentials and then approve the authentication request received on a registered mobile device to login to VPN. When PBR is enabled at gateway launch time, all VPN user traffic arrives at the gateway will be forwarded to a specified IP address defined as PBR default gateway. User must specify the PBR Subnet which in AWS must be in the same availability zone as Ethernet 0 interface of the gateway. When PBR feature is combined with encrypted peering capability, VPN user should be able to access any instances in the peered VPC/VNets. This helps build an end to end cloud networking environment. For details, check out our reference design. Another use case for Policy Based Routing is if you like to route all Internet bound traffic back to your own firewall device on Prem, or log all user VPN traffic to a specific logging device, PBR lets you accomplish that. Active VPN users are displayed on the Dashboard. Click on any username, the user VPN connectivity history is displayed. You can also disconnect a user from the dashboard. Yes. Aviatrix VPN client is the only OpenVPN® based client software that support SAML authentication from the client software itself. Read here to learn more. Aviatrix’s VPN Client supports SAML authentication from the VPN client itself. If you need the VPN client itself to authenticate against an IDP (for example, Okta, Google, AWS SSO and Azure AD), you will need to use the Aviatrix VPN client. Aviatrix VPN gateway can authenticate a VPN user against OKTA on behalf of a VPN user. In that case, you don’t need Aviatrix VPN client, any OpenVPN® clients software such as Tunnelblick can be supported. Note this is about the OpenVPN® configuration file that is installed on end user machines. Aviatrix’s VPN Client allows you to load and switch between one or more VPN profiles. Click Connect button. A drop down will appear. Enabling this feature allows the same user to be logged in from more than one location at a time. If this option is disabled and a user logs in from a second location, the first location will be disconnected automatically. How do I change the Renegotiation interval? How do I change the idle timeout? Scroll down to MODIFY SPLIT TUNNEL, select yes to Split Tunnel Mode. At Additional CIDRs, enter the list of CIDR blocks including the new VPC CIDR that you wish the VPN client to access. When complete, click Modify for the configuration to take effect. Disconnect the VPN client and connect again, the new CIDR should take effect. Aviatrix OpenVPN® gateway performs NAT function for the user VPN traffic, effectively masking out the VPN client’s virtual IP address assigned by gateway from the VPN CIDR Block. This does not affect profile based policy enforcement as the landing vpn gateway has the information of the virtual IP address before NAT is performed and enforces policies based on user identification. If you do want to preserve the virtual IP address after the client packet leaves the gateway, you can do by enabling PBR function. If the destination is another instance within the cloud provider, then OpenVPN gateway’s private IP address is used to NAT the OpenVPN Client’s traffic. But if the destination is outside the clour provider(the Internet), then the public IP address of the OpenVPN Gateway is used. OpenVPN® is a registered trademark of OpenVPN Inc.